Behold beasts from beyond imagination! * Expanded Size Rules, create creatures of any size, even larger than universes... should you need them. * Rules on how Density can be a factor in your game, leading to Virtual Size Categories. * A Glance at the Kosmos, outlining the various dimensions, as well as their rules and inhabitants. * Dimensional Race, Angels (Devas) detailed: from stoical demi-powered Elohim to the majestic cosmic-powered Seraphim. * Over 40 truly epic monsters from CR 10 to beyond CR 1000; including the unstoppbale Neutronium Golem and the awesome World Flayers. * 5 Templates (with examples); such as the immortal devouring Akalich; the devastating Macrobe creature and the ultimate expression of evolution, the Amidah. * Each entry has multuple adventure ideas. Almost every entry has round-by-round tactics. * Over two dozen new artifacrts and epic spells. 11 new epic feats, including the basis for a whole new spell system. Requires the use of the Dungoen & Dragons Player's Handbook. 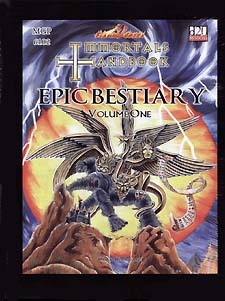 Compatible with 3rd Edition and Revised 3rd Edition rules.